Washington’s Makenna Knisley scores in the seventh inning of a non-conference game with Eastern Brown at home Monday, April 1, 2019. Knisley drove in six runs with three hits including a home run and a double. 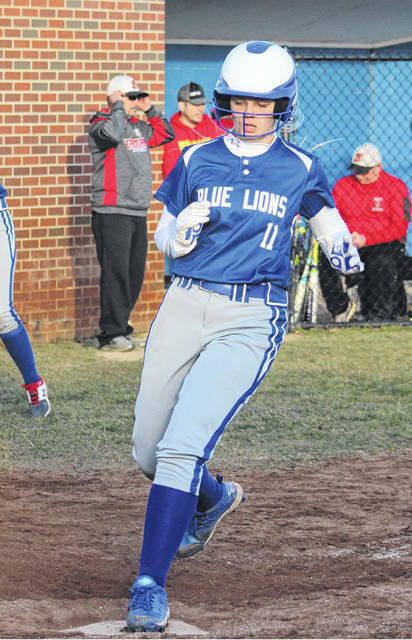 On a sunny, bright, but deceptively chilly April 1, the Washington Lady Blue Lions varsity softball team hosted the Warriors from Eastern Brown High School. Washington took an early lead, fell behind, but battled to the end. As the sun was setting over Fayette County, Eastern Brown recorded the final out of a 17-9 victory. Eastern Brown scored two runs in the top of the third. Makenna Knisley hit a three-run home run, her first of the season, to give Washington a 3-2 lead. After a scoreless second inning, Eastern scored four in the third, two in the fourth and three more in the fifth to go in front, 11-3. The Lady Lions scored twice in the bottom of the fifth. Eastern scored six runs in the top of the sixth, threatening to end the game by the 10-run rule with a 17-5 lead. However, Washington continued to battle, scoring three in the bottom of the sixth to make it 17-8. Eastern did not score in the seventh and Washington scored one in its last at-bat for the 17-9 final. Knisley went 3 for 4 at the plate with the above-mentioned home run and also a double, finishing with six rbi. Maddy Jenkins was 3 for 4 for Washington with one rbi. Emma Funari was 2 for 3 for the Lady Lions with a run scored. Knisley started and took the loss in the pitcher’s circle for the Lay Lions. She pitched four innings with 11 hits, eight runs (seven earned) with one walk and one strikeout. Brooklyn Devenport pitched the final three innings for Washington with nine hits and nine runs (three earned) with five strikeouts and one walk. T. Dotson was the starting and winning pitcher for the Warriors. She allowed 10 hits and nine runs (eight earned) with 10 strikeouts and five walks. “We’re still not stringing a lot of hits together,” Washington head coach Randy Elzey said. “Our hits are coming, one here and one there. We’ve got to start swinging the bats more aggressively and putting the ball in play a little better. “Tonight we had three hitters with at least two hits,” Elzey said. “Makenna Knisley hit a nice shot there in the first inning and later she hit a double. Emma Funari came in as our designated player/flex. We ended up letting her hit the last couple of times and she put the ball in play. She stepped up in the occasion like we asked her to do. “Maddy Jenkins had a couple of nice hits tonight, as well,” Elzey said. “We just need to put our hits together. Hillsboro is at Washington Wednesday for the Frontier Athletic Conference lid-lifter. The Lady Lions (0-3) travel to Logan Elm Thursday and host FAC opponent’s Chillicothe Friday. Offensively for Washington: Kassidy Olsson, 1-5, 1 run, 1 sb; Brooklyn Devenport, 0-2, 2 runs, 2 bb; Maddy Jenkins, 3-4, 1 rbi; Makenna Knisley, 3-4, 2 runs, 6 rbi, 1 home run, 1 2b; Kassie Wiseman, 0-1; Meredith Pabst, 1-4, roe; Kearria Marcum, 0-0; Corynn Chrisman, 0-3; Haven McGraw, 0-1; Emma Funari, 2-3, 1 run; Taylor Smith, 0-1; Mallori Tucker, 0-1, 3 runs, 2 sb; Brooklyn Foose, 0-2, sac. LOB: 7. Offensively for Eastern Brown: M. Dorsey, 3-6, 3 runs, 3 2b, 2 roe; A. Minnix, 1-5, 1 run, 1 rbi, 1 sb, fc; A. Edminston, 2-5, 2 runs; A. Milott, 2-3, 3 runs, 1 rbi, 2 bb; M. Reynolds, 3-4, 1 run, 4 rbi, 1 2b, hbp, 1 sb; K. Tomlin, 3-5, 3 runs, 4 rbi, 1 2b; E. Bradford, 0-3, roe; A. Moran, 0-2, 1 run; T. Dotson, 2-5, 3 rbi, 1 2b; M. Murphy, 4-5, 1 run, 1 sb; K. Reynolds, 0-0, 2 runs. LOB: 8.